I had the opportunity to visit Dubai for a few days. I was excited about the trip because it has increasingly become the place to visit amongst friends who travel. 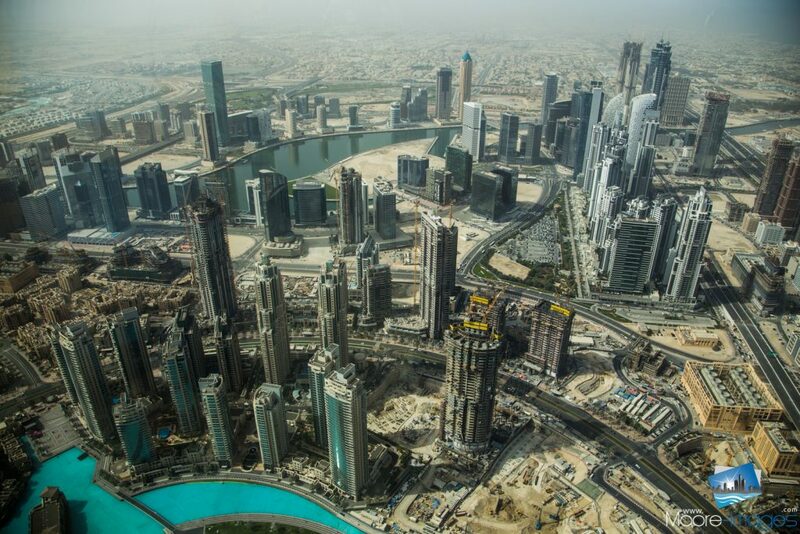 I didn’t know much about the place other than it was a wealthy playground with many new buildings, a man-made island, a mall with a ski-slope inside and the tallest building in the world, Burj Khalifa. Dubai is part of the UAE which was established in 1971 (an excellent year for people, places or things to be established, my birth year ). The UAE’s official language is Arabic. However, English is the language of business. The importance of English is evident as every building name is written in both languages. Nearly every brochure, pamphlet, etc. is written in both also. 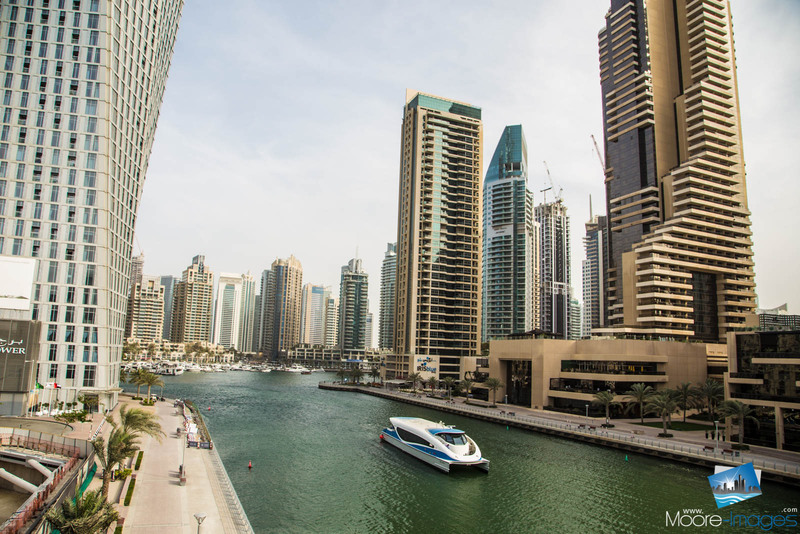 Dubai, unlike other major cities in the Middle East, plans to be the tourist and financial center of the region with 50% of the world’s population is within a 5-hour plane ride. With a world-class waterpark, miles of beachfront property, and many other amenities in the works, Dubai is that oasis in the desert. When I arrived, I was immediately struck by the many skyscrapers built and being built. Construction is omnipresent. A few years ago, Dubai had nearly 25 percent of the world’s cranes. With all the development that has already started and/or completed, there are many more projects underway. It has a futuristic aura with buildings that represent technological and construction innovation. They have several man-made marinas with luxury apartment buildings filing the skyline. 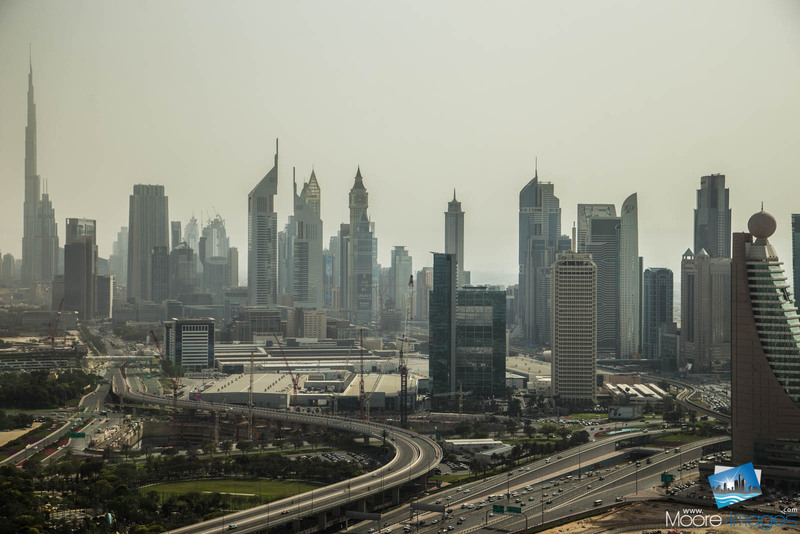 With all the new structures, it could seem as if Dubai didn’t exist more than two or three decades ago. The crown jewel of the new construction is the Burj Khalifa. It earned the title as the tallest building in the world in 2008. The viewing deck from the 124th floor dwarfs everything in the area. I’ve been to the Empire State Building, the Sears Tower and a couple of other tall buildings. This was impressive, but as someone who doesn’t like heights, I just wonder why do I keep finding myself atop these buildings. One of the most impressive construction feats is the Palm Jumeirah. It’s the man-made island containing impressive residential properties and several luxury resorts including the Atlantis, The Palm. It includes the largest waterpark in Europe and the Middle East. Residential villas and penthouses on the island come with a premium price. To entice buyers, developers were giving away Lamborghinis to purchasers of the high-end properties. There is also the traditional side of Dubai. The area is filled with immigrants representing the working class. 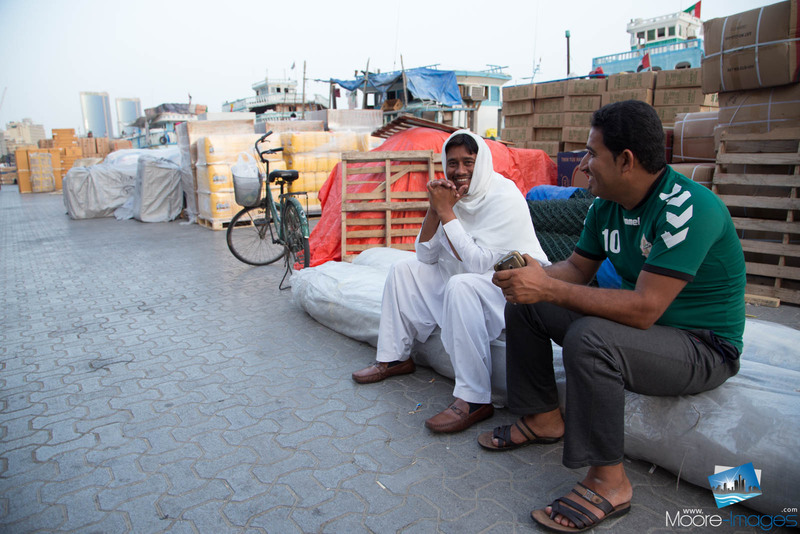 They come from Kenya, Pakistan, and other countries throughout Asia, Africa, and Europe to realize opportunities and their hard work is what keeps Dubai moving. Two of my taxi drivers were from Pakistan and have lived in Dubai for six years. They both work 12+ hours every day. Not only are the driving taxi’s, but these workers provide customer service in the hotels, retail stores, construct the buildings, and work wherever the opportunities are. Merchant vessel workers while the twin towers of Rolex stand faintly in the background. There are multiple malls within Dubai representing the cutting-edge of technology. One has an indoor ski slope. The Dubai Mall adjacent to the Burj Khalifa has the fountain with the water show every half-hour during the evening time. 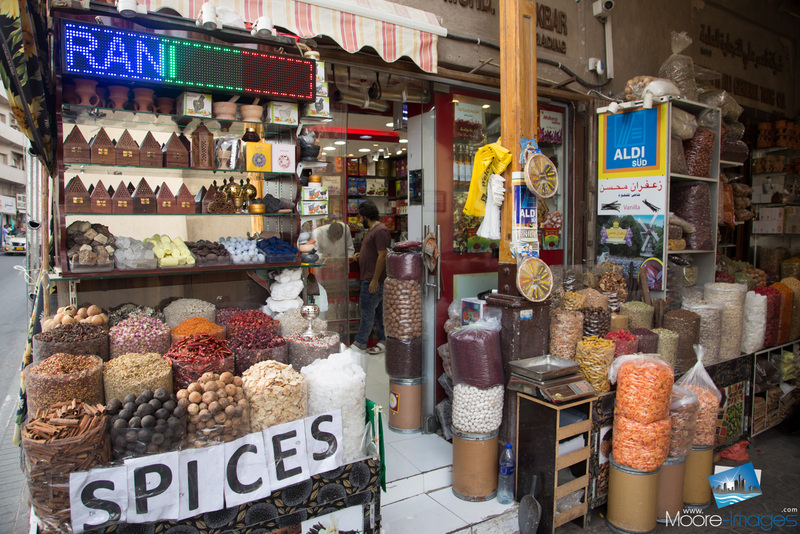 If you desire a simpler setting, the souks (Arabic for marketplace or bazaar) are rich in color and fragrances filled with local merchants selling spices, fruits, nuts, and other bargain goods. One must have a patient attitude to respectfully decline the constant bombardment from the vendors trying to convince you to visit their shops. There’s also the gold souks nearby with a plethora of jewelry for those with an appetite for 22 or 18k gold and other accessories. One of the many shops within the Old Souks part of town. There are many options for shoppers throughout the city. My favorite place displayed a combination of modern construction with classic Middle-Eastern design, Souk Madinat Jumeirah. It has a town center feel with small boutiques inside and restaurants with outdoor seating lining the area. It also contains a small stadium-like seating area for outdoor performances. All of this with a small man-made canal flowing through the souk with palm trees on the banks. 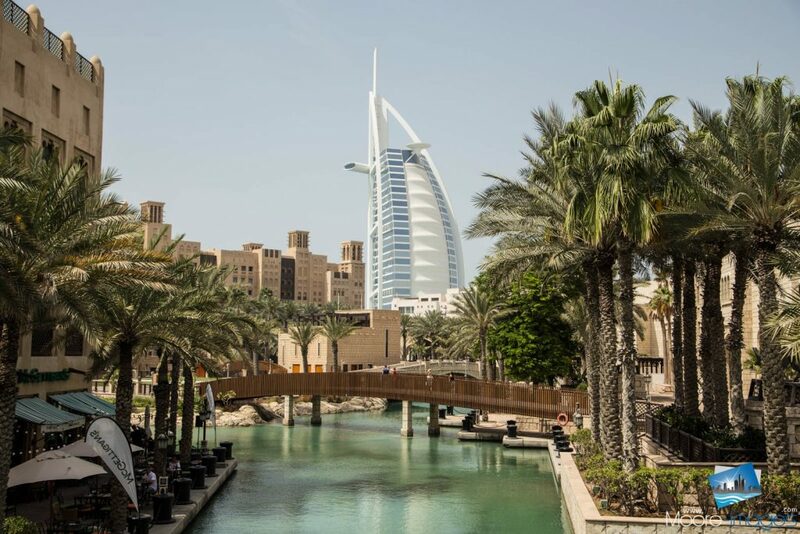 Souk Madinat Jumeirah with the famous hotel, Burj Al Arab, towering in the background. I used the City Sight Seeing tour bus to get a quick summary of the city sights. One of the stops was the Jumeirah beach. It’s a public beach situated next to the famous hotel, Burj Al Arab. It’s a 5-star hotel referred as a 7-star one even though it does not have the “official” designation. 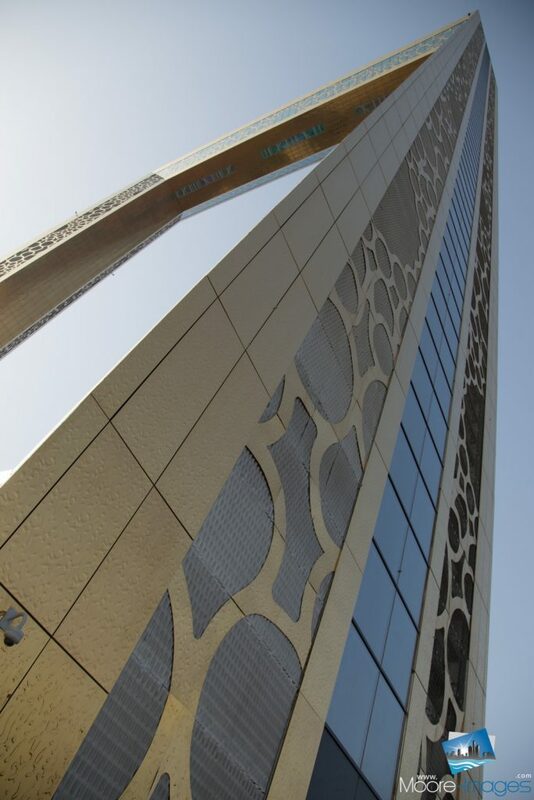 The Dubai Frame stands between new and old Dubai. It’s a physical representation of viewing what’s new and what’s historic in the city. Living in the metro DC area for the past 20 years, there are several areas that have transformed in the past two decades. I can only imagine what Dubai will look like in the next 20 years. I hope to be able to visit again prior to that, but if not, I’m certain it’ll be worth the wait. I apologize for the long absence from my website. I continue to photograph my experiences and share my thoughts. However, most of my sharing has been via Facebook. I’m recommitting myself to my blog. I thoroughly enjoy writing about my experiences over the years. Yet, I became spoiled when I traveled overseas and because I haven’t done any personal overseas travel, I let that hinder how much I share. Since then, I’ve learned a sincere love for photography enables one to find beauty in their backyard and daily experiences. Therefore, my personal challenge is to offer you short stories with a few images chronicling my life without requiring travel to distant lands. With that out the way, let me share my most recent project. I created another time-lapse video. I’ve done this when I lived in England and every neighborhood since that time. I enjoy this project because it allows me to record the yearly changes in my neighborhood. It’s also a reminder that as things change, they also remain the same.